BELFORT (Alstom press service) – Alstom and AO Locomotive, a subsidiary of the Kazakh Railways, Kazakhstan Temir Zholy (KTZ), have signed a contract for the full maintenance, major overhaul and modernization of 27 passenger locomotives KZ4AC for a period of 25 years. The contract valued at around €100 million is effective immediately. First product of a new range of locomotives dedicated to Kazakhstan market, KZ8A is the most powerful freight locomotives in the world able to haul up to 9,000 tons and run at 120 kph. It can operate in extreme weather conditions with temperatures ranging from -50°C to +50°C. This locomotive offers drivers comfort over long distance through its large cabin equipped with microwave, fridge, floor heating, comfortable heated seats and foot rests. The KZ8A locomotive is now under Russian certification and will enter into dynamic tests in Kazakhstan in January 2013. This is the first maintenance contract for Alstom in Kazakhstan and a cornerstone for a long-standing maintenance business in the country, offering a sound basis for growth. The KZ4ACs passenger electric locomotives run mainly between Astana and Almaty and have been in operation for 3 years. Alstom will provide maintenance in a depot in Astana, with a satellite depot to be set up later on in the south of Kazakhstan. “Kazakhstan is a strategic market for Alstom, thanks to its geographic position, its fast economic growth and its commitment to modernisation. This order proves KTZ recognition of Alstom’s technology and trust in Alstom’s expertise as a leading global railway manufacturer,” said Henri Poupart-Lafarge President of Alstom Transport. “With this long-term contract Alstom becomes a major player for rolling stock maintenance in Kazakhstan”, added Bernard Gonnet, Alstom Transport’s Senior Vice President in charge of Russia and CIS. Alstom is currently executing a contract which the company was awarded in 2010 by KTZ for the delivery of 200 double freight (KZ8A) and 95 passenger locomotives (KZ4A). 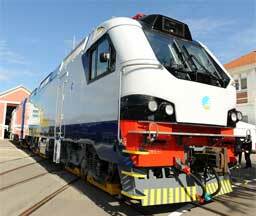 The first locomotives will be delivered in 2012. While the first 10 pre-series of KZ8A locomotives are being manufactured at Alstom’s Belfort facility, the remaining will be built in Astana, the new Alstom plant in Kazakhstan. This site for which the first stone was placed on June 26, 2010, will be inaugurated on December 12, 2012. Shortly after, the site will be able to start the production with a capacity of up to 80 locomotives per year. This contract will result in the creation of 650 qualified jobs in Kazakhstan.